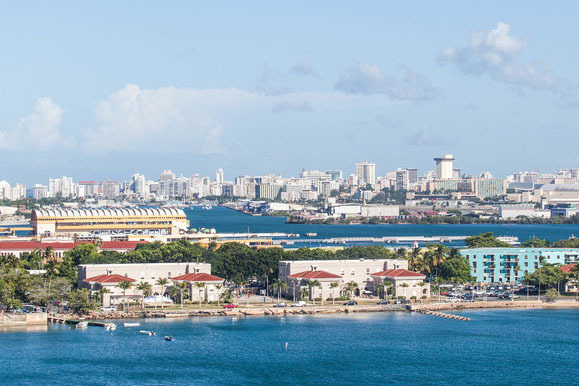 In many Caribbean ports, active excursions such as zip-lining, kayaking and hiking have replaced lazy days on the beach and the gridlock in shopping and sightseeing areas. But even though it's the capital of the island chain Turks and Caicos, Grand Turk maintains a slower pace of life. 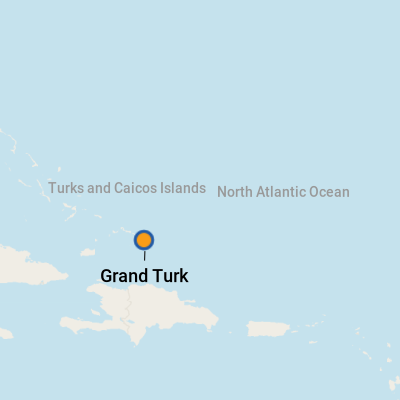 Though Grand Turk is part of Eastern Caribbean itineraries, it is interesting to note that Turks and Caicos is not a part of the Caribbean at all. Each island is surrounded on all sides by the Atlantic Ocean, and though it's only about 30 miles south of the Bahamas, it's not a part of that chain of islands, either. Shore excursions on Grand Turk run the gamut from horseback riding to fly fishing -- and one of the biggest draws is diving, with the islands -- technically in the Atlantic, not the Caribbean -- lying along one of the largest barrier reefs in the world. But traffic is sparse, and with a population of about 5,000, most people know one another's names. There are no fast food restaurants or chain hotels. You may even see a horse or donkey, once a means of transportation during the days of Grand Turk's salt industry, roaming along Governor's Beach or through the narrow alleys in historic Cockburn Town. Though only smaller-ship and luxury cruise lines such as Crystal and Silversea once called at Grand Turk, Carnival Corporation has committed time -- and money -- to positioning the port as a mainstream cruise destination. Carnival Corp.'s cruise terminal is a destination in its own right, with retail shops, a recreation area on the beach and a huge pool. The pier can accommodate two mega-ships, theoretically from any of the many cruise lines under Carnival Corp.'s umbrella, including Princess, Carnival and Holland America. The company is also developing a new downtown welcome center. In 1962, long before cruise lines were interested in this little island, John Glenn -- the first American to orbit Earth -- splashed down just a mile or two off the coast of Grand Turk and spent his first couple of days there after his historic space flight. Some reports quote Glenn as saying it "must be paradise" when he spotted the 40 coral islands from space. Whether viewing it from space or sea, we have to agree. In 2012, Grand Turk celebrated the 50th anniversary of the splashdown with new murals, monuments and additions to Splashdown Grand Turk, a 3,500-square-foot attraction explaining the space program and Friendship 7 mission, located at the cruise center. This exhibit is free and open to the public. Ships dock on the southwestern tip of the island, at a pier built specifically for cruise ships; the facility is owned and operated by Carnival Corp. There's a number of duty-free shops, jewelry stores, souvenir stands, bars and restaurants located in the cruise center. Adjacent to Margaritaville, you can even find a FlowRider. Froots and other facilities in this area have free Wi-Fi. 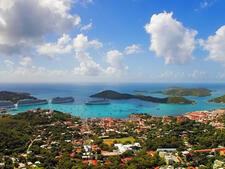 The port is located near a tourism village packed with restaurants, amenities and jewelry and trinket stores. One of the largest pools in the Caribbean is located conveniently outside of the Caribbean's largest Jimmy Buffett's Margaritaville restaurant. You also have direct access to an 800-foot stretch of beach with cabanas and changing rooms. Not long after you disembark the ship and walk onto the beach, you'll see hammocks encouraging you to pass out there for a while (and it's tempting). According to the State Department, the overall crime rate in the Turks and Caicos Islands is relatively low, and crimes typically involve opportunistic petty theft. Exercise a sensible level of caution if walking around at night, and keep valuables in a safe location. 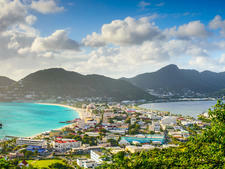 The CDC recommends hepatitis A and typhoid vaccinations when visiting the Turks and Caicos. If you will be anywhere near caves on an excursion or while exploring, be sure to have an updated Rabies vaccine, as bats can carry the virus. Also be sure to bring insect repellent due to reports of mosquito-borne illnesses, such as Chikungunya. By Rental Car: Tony's Car Rental (649-231-1806) offers car, scooter and bicycle rentals. Car rentals start at $70 per day; open-back Jeep rentals start at $95 per day. Golf carts can also be rented on the island. By Taxi: Taxi fares are set in advance -- look for posted signs; a ride from the cruise terminal to the downtown area should be around $7. The walk into town is approximately three miles, but the tourism board warns it's a very hot walk with no sidewalks, so your best bet is to take transportation. By Bus: Grand Turk does not have an organized public bus system; bus stops seen around the island are, for the most part, spots for students to grab shuttles. Plan an organized excursion, or expect to rent a car or grab a taxi. By Island Tram: Tram tours have a set route circling the island, but you can hop on or off at any juncture. Tickets are $25 per person, but the trams run on an irregular schedule, so be sure to catch one closest to when your ship docks. If you miss a morning tour, another might not run for two hours. The official currency of Turks and Caicos is the U.S. dollar. Scotiabank offers two ATMs located in Waterloo Plaza; it's open 9 a.m. to 3 p.m. Monday to Thursday and 9 a.m. to 4:30 p.m. Friday. The ATM is open 24 hours a day. The island's primary language is English. Spanish and Creole are also widely spoken. Most restaurants you will encounter in port cater to tourists and provide Americanized versions of bar food and pub grub: burgers, quesadillas and mixed salads, with some fresh seafood on the menu. But the name of the game is conch for Caribbean cuisine, and Grand Turk is no different. Editor's Note: Because the island is so laid back, addresses and hours are often flexible or unlisted; unless otherwise noted, lunching suggestions are located on the main drag in Cockburn Town. Shopping is a limited pastime, and this sleepy island is not the place to stock up on mass-produced T-shirts. The gift shop at the National Museum is a great place to pick up straw trinket boxes and other handmade goods. The Shell Shack, open during Grand Turk's high season (roughly December through April), offers items such as picture frames made from shells and driftwood. Try a rum punch, a concoction of coconut rum, dark rum, pineapple and orange juices and grenadine. The best we've had is at Sandbar, across from Manta House on Duke Street. If throwing back a beer is more your style, try Turks Head, brewed on nearby sister island Providenciales.